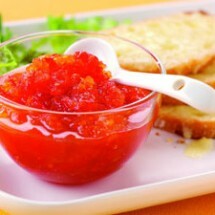 This fiery chilli and tomato relish is perfect for perking up all kinds of recipes – from cheese on toast to home-made chilli con carne – or use it to add flavour to a simple stir-fry. Use it as both an accompaniment and as an ingredient. Put the chillies, onion, tomatoes, ginger and garlic into a food processor. Chop finely, but avoid over-processing, as you want the finished sauce to have some texture. Transfer the chilli mixture to a large saucepan and add the vinegar, salt and sugar. Bring up to the boil, stirring occasionally until the sugar dissolves. Simmer gently over a low heat, without a lid, until the sauce has reduced to a syrupy consistency. This will take 45 minutes – 1 hour. Stir the mixture from time to time as it cooks. Remove from the heat and pour into warm sterilised bottles. Seal whilst hot. Keeps for 1 month unopened, and for 2 weeks in the refrigerator once opened. Cook’s Tip: Take great care when preparing fresh chillies. Avoid rubbing your eyes or touching your mouth – or else they will burn. Rinse your hands in cool water after preparing them, then wash them thoroughly. If you’re very sensitive to them, wear a pair of disposable plastic gloves.